Agricultural producers use heated water for a variety of jobs, including general cleaning of structures, equipment, livestock, poultry, fruit, and vegetables and to sterilize equipment. Dairy farms use especially large quantities of hot water daily for both cleaning structures and equipment and for processing milk products. Although electrical water heating is not uncommon, most agricultural producers use propane (LP) or natural gas because of their higher efficiency. In addition to gas and electric water heaters, agricultural producers also use heat recovery units, waste oil burners, solar, and/or geothermal energy to heat water and provide supplemental water heating. The first step in cost-efficient water heating is to limit the total amount of water used and, more specifically, the amount of heated water being used. Limiting water consumption and reducing the amount of water that must be heated can lower monthly energy use significantly. Regular maintenance of the entire plumbing system is necessary, and all water leaks should be stopped. Install low-flow fixtures and water-saving, energy-efficient appliances. Image: U.S. Department of Energy. Insulate your water heater’s storage tank unless it already has a high R-value of insulation (at least R-24). Adding insulation can reduce standby heat losses by 25% to 45%, saving you around 4% to 9% in water heating costs. DOE’s instructions for installing an insulation blanket on an electric water heater. Keep the jacket or blanket away from the drain at the bottom and the flue at the top. Make sure the airflow to the burner isn’t obstructed. Don’t insulate the top of a gas water heater tank — the insulation is combustible and can interfere with the draft diverter. Photo: Wendy Sue Harper, Ag Communication Consultant, UVM eXtension. 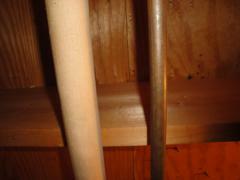 Insulate all exposed hot water lines and components to limit heat losses. Use high-quality pipe insulation wrap, strips of fiberglass insulation, or pipe sleeves made with polyethylene or neoprene foam. When selecting or replacing a water heater, gas water heaters are recommended over electric units if LP or natural gas is available. Hot water heaters should be selected based on their efficiency, with water heater size, recovery, and temperature carefully matched to application requirements. Demand (tankless or instant) water heaters provide hot water only as it is needed, and so they don’t produce the standby energy losses associated with storage water heaters. During warmer seasons of the year, temperature settings for water heaters may be lowered to reduce operating costs. Supplemental heat sources may be used to reduce water heating fuel costs; at certain times of the day and/or year, they may provide all the hot water needs. Condensing water heaters recover a great deal of heat that is normally lost through gas water heater flues. Condensing water heaters can increase the efficiency level of a typical 80% efficient gas water heater to levels near 95%. Most water heaters are tested by an independent testing agency to measure and verify the performance based on the Air-Conditioning, Heating and Refrigeration Institute (AHRI) certification standards. The AHRI maintains a website available to the public with the test ratings for water heaters and other heating and cooling equipment at Directory of Certified Product Performance. The ratings are divided into residential and commercial; they can be searched by type, brand, size, energy source, and other factors. Example: If a 98-gallon gas water heater has a thermal efficiency of 80% and standby loss of 1,238 Btu/hr., what is the Energy Factor? The energy factor for a gas- or oil-fired storage water heater averages about 0.55, while a high-efficiency condensing-type heater can be as high as 0.87. Instantaneous water heaters avoid standby heat losses by heating water on demand. Their energy factors are typically above 0.80. They are rated based on a maximum water flow rate and temperature rise, so it is important to consider the need for short duration use of instantaneous water heating versus higher-demand water heating where tanks are advantageous. When purchasing a new water heater, check the AHRI ratings and look for units with a high energy factor that will satisfy the water heating requirements. Solar water heating and other solar applications for agricultural production. U.S. Department of Energy. Guidelines for replacing a hot water heater and tuning up a dairy washing system. Wisconsin Department of Agriculture. 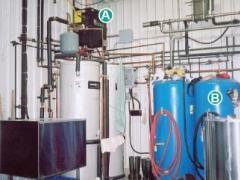 Heating Water on Dairy Farms. Scott Sanford, University of Wisconsin Extension. Managing Energy Costs in Dairy Farm Facilities. UPPCO, Upper Peninsula Power Company. Water Efficiency and Conservation in Fruit and Vegetable Processing. N.C. Division of Pollution Prevention and Environmental Assistance.